The Bournemouth University Dementia Institute (BUDI) works with others to help create an inclusive and supportive society for people affected by dementia. The BUDI team and the Bournemouth Symphony Orchestra (BSO) had no idea how this would pan out. This is the first time that we’re aware of where people with dementia have been given the opportunity to work alongside orchestra musicians and to gain confidence, relearn instruments or to learn them for the first time. It was something of a leap of faith to try to do this based on a hunch I had that, if people can come together as a choir, could we not also do this as an orchestra? I was completely humbled by the successful use of the creative skills of the BSO musicians and BUMusic scholars as they led an initiative for those living with dementia and their family members and support workers. The photo gives you an idea of what happened. 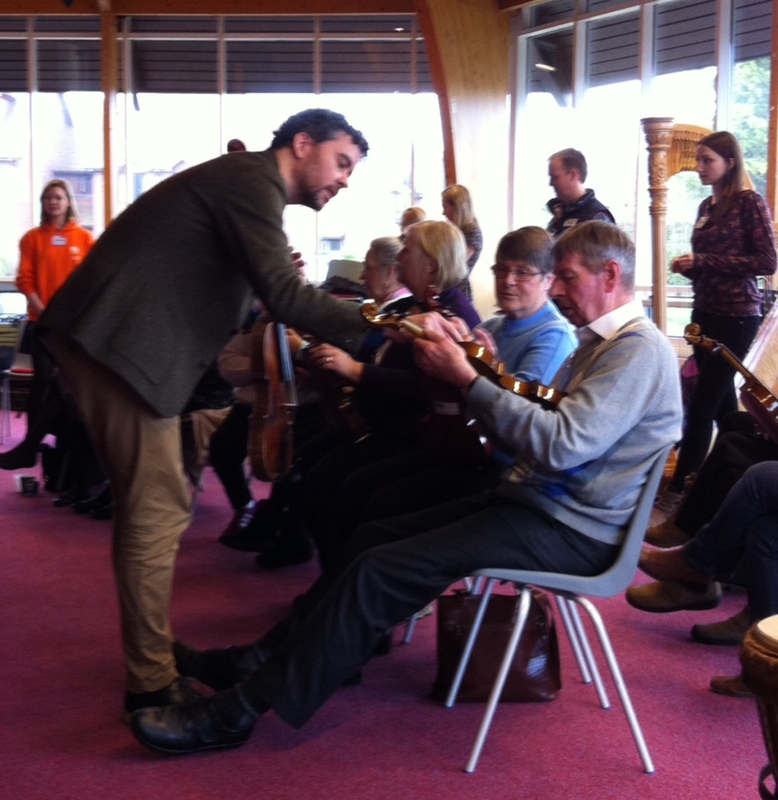 It was amazing to experience people with dementia who had lost their musical skills – or perhaps more accurately, their confidence – bringing their instruments and regaining their musical confidence to play alongside the professional musicians. And perhaps more amazing was to witness some of our participants who had never touched a string instrument learn some notes and then play a piece, Bolero, together. I too managed to play a few notes on a violin (or maybe it was a viola!?). The community musician knows his stuff and directed us all to enable the musicians to play something – and in relative harmony! Two of our BUMusic scholars, while a little hesitant initially, took the initiative to lead some of the singing that was part of this initial rehearsal and their skill in using their talents to engage and encourage the group was amazing to watch. I had the pleasure of being taught how to play a few notes (badly) on the double bass by one of our participants with dementia, which was probably the best part of the morning for me. I have a soap box position about how when someone has dementia it is possible to continue to learn new things and also for people with dementia to help us learn new things. Today was just another inspiring example of that.